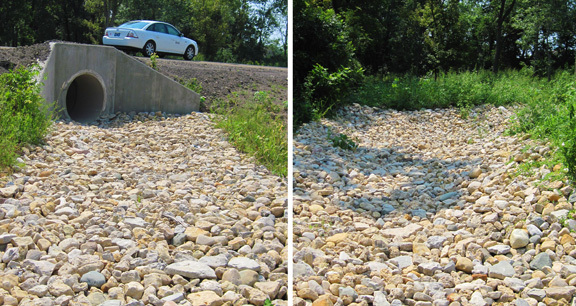 Project obstacles and solutions: The Wayne County Highway Department was looking for an erosion control aggregate that could be placed around box culverts, pipelines and ditches. However, they were looking for an aggregate that would add a little natural color to these areas in lieu of using crushed stone. They turned to IMI Aggregates. It was suggested that they use a gravel rip rap in these areas. Unlike the light gray hues found in limestone, gravel is multi-colored. It also is rounded where crushed stone is more angular. IMI supplied 800 tons of gravel rip rap for this project from its Cambridge City quarry. For more information on using gravel for erosion control, contact one of our sales representatives Click here.